Frederick T. Zugibe, Ph.D., M.D. passed away on Friday, September 6 at age 85. In 1969 he was appointed the first chief medical examiner of Rockland County replacing the old coroner system. He served as Rockland's chief medical examiner for 34 years retiring in 2003. During his tenure, the Rockland Medical Examiner's Office gained an international reputation in the field of forensic science and innovative techniques and inventions still in use. 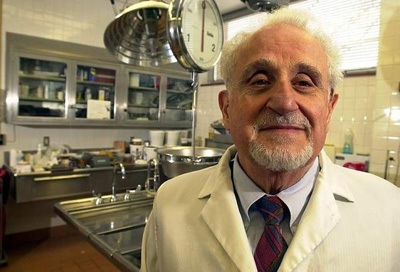 Dr. Zugibe was born on May 28, 1928 in Garnerville, NY to Benjamin and Zarick Zugibe. He is survived by Catherine (O'Leary), his wife of 62 years, and six of his seven children: Thomas (Peggy), Cathryn Blaber (Thomas), Theresa Mandracchia (Stephen) Mary Raleigh (Peter), Matthew (Carol) and Kevin Zugibe. His son Thomas is Rockland County’s District Attorney. Dr. Zugibe was predeceased by his son Frederick T. Zugibe, M.D. (Anna) in 2006. He is survived by 18 grandchildren and five great grandchildren. He was a parishioner at St. Peter’s Roman Catholic Church in Haverstraw, member of the Secular Franciscan Order. In 2002, he was received as a knight in the papally approved Order of Our Lady of the Conception of Vila Vicosa in Portugal. Dr. Zugibe graduated from Haverstraw High School and St. Francis College. He earned a Masters Degree from Columbia University and a Ph.D. in anatomy and histochemistry from the University of Chicago. After having seven children, he returned to school and obtained his M.D. degree from West Virginia University in 1968 and became Board Certified in Anatomic and Forensic Pathology. Dr. Zugibe was internationally lauded in the field of cardiovascular research and discovered several diseases that had never before been identified. He was a fellow in the American College of Cardiology and Board Certified in Family Practice. He also had an active medical practice during his tenure as Medical Examiner, specializing in cardiology. Dr. Zugibe was an author known for his scientific research on the Shroud of Turin and the mechanism and cause of death of Jesus appearing in numerous documentaries in connection with his research. He wrote The Crucifixion of Jesus, a Forensic Inquiry and Dissecting Death: Secrets of a Medical Examiner and other books and papers. He also served as adjunct Associate Professor of Pathology at Columbia University College of Physicians and Surgeons. Dr. Zugibe established the first disaster response protocol for Rockland County, coordinating training among all law enforcement, medical and emergency response teams and conducting EMT classes. As medical examiner, he established protocols to support the donation of organs and corneas, while still maintaining the integrity of Anna death investigations. In 1972, he joined relief efforts in Nicaragua providing medical care to earthquake victims. Whether it was comforting a victim's family at the scene of an investigation, responding to a medical emergency, or giving his time and support to innumerable individuals and groups who needed his help, Dr. Zugibe worked tirelessly on behalf of those in need and in service to the community. He was devoted to his family and took immense pleasure and pride in their endeavors. His vast knowledge and accomplishments were only surpassed by his compassion for the suffering of others and the love of and for his family. Frederick T. Zugibe, M. D., Ph.D.